I received a large package today from the lovely Rachel from My Panda Island. 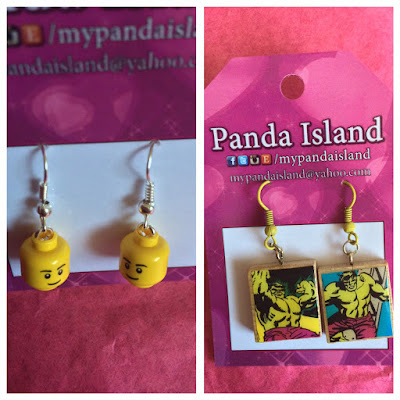 My Panda Island is an Etsy shop that's been going for around 2 years. Rachel also sells at Rochester Flea Market in Kent and at Comic Book Conventions in and around the South East area. She's actually at Comic Con in London next weekend (15th, 16th, 17th July 2015)! Rachel's shop really stood out to me as all the figures, lego etc that she uses to create her items are official licensed merchandise. This is refreshing as a lot of sellers tend to use knock offs. So, on to the review! Shipping was extraordinarily quick and my order was securely packaged in a box, with all the items in cute patterned bags sealed with panda stickers. 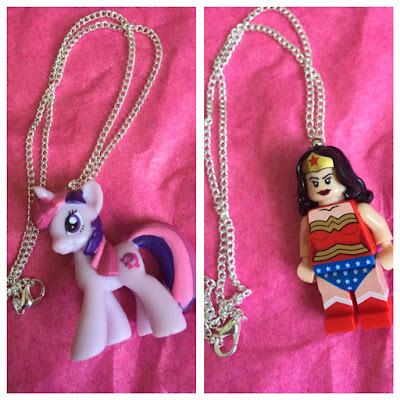 I received these two gorgeous necklaces. One is a Blind Bag Pony that looks a lot like Twilight Sparkle but it's actually not. She's so beautiful and the chain is very high quality. I also received this cute Lego Wonderwoman necklace. They are both absolutely adorable and feel so sturdy as well! I'm in love with them and will definitely be wearing them non-stop. These two hair bows are so pretty it's unreal. 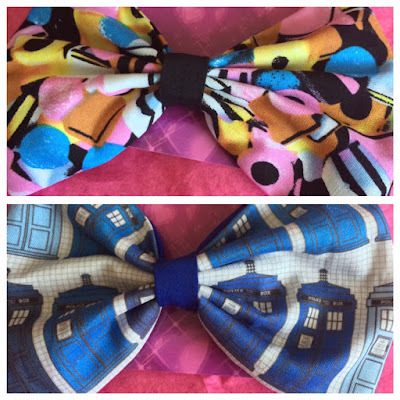 The first one that I got has Liquorice Allsorts on it and the second one is Dr Who fabric (aaaw!!!). They're both fairly large and secured onto robust alligator clips. I also received 3 pairs of earrings. I got these adorable dangly lego heads, some dangly Hulk earrings which are attached to little scrabble tiles and some lego block stud earrings. They are all beautiful and very well made. 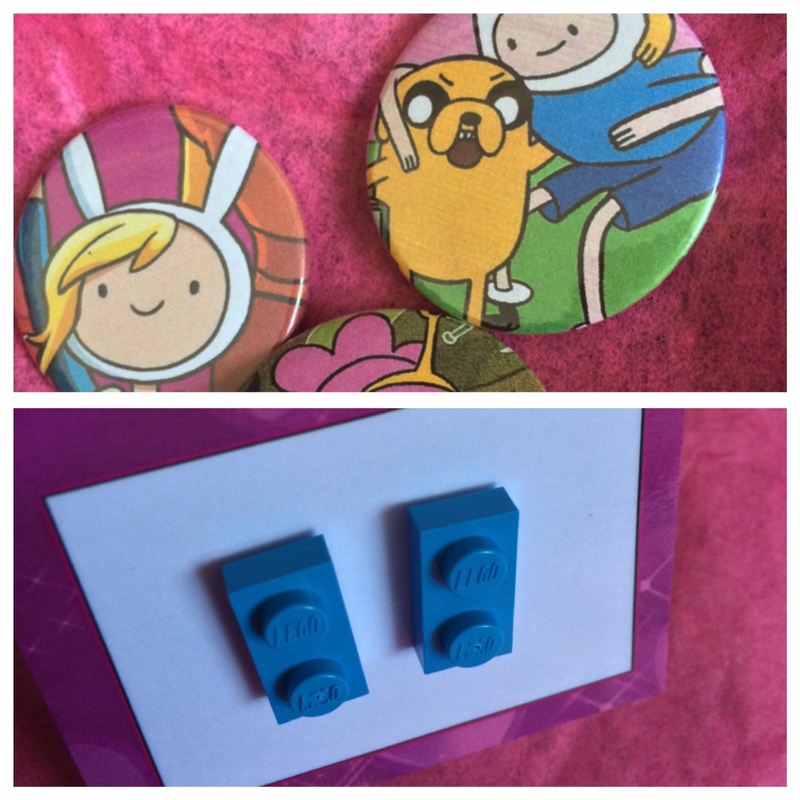 I was kindly given some Adventure Time badges too which are right up my street and so stinking cute! I would absolutely 100% recommend My Panda Island to everyone who enjoys cute and slightly nerdy accessories and jewellery. Reach Rachel on Instagram, Facebook, Twitter (which is what she mainly uses) and obviously Etsy!